Toy knights, medieval miniatures, and model castles have been passions of mine for the past ten years, as those of you who have looked at the “Knights” page of my website will know. I have work by all the masters, and have even commissioned some of them to paint figures in the heraldry of my own Seven Kingdoms. So you can imagine how pleased I am to announce that soon Westeros will have figures all its own. I have just signed an agreement with the Testor Corporation for not one, not two, but three lines of miniatures based on the world and characters of A SONG OF ICE AND FIRE and I’m as excited as a kid on Christmas morning. large-sized resin miniatures in 1/18 scale, done in resin and fully painted, for fans and collectors who would rather not build kits or wield a brush themselves. Initial plans call for the first of the painted resin figures to be released in September of this year. Next will come the 54mm signature figures. Testor’s hopes to have eight ready for simultaneous release in January, 2006, and work on the range is already under way. Legendary sculptor Tom Meier of Thunderbolt Mountain Miniatures has already finished sculpting the first figure, a double of Jon Snow and Ghost from the pages of A Game of Thrones. For a sneak preview, click here. 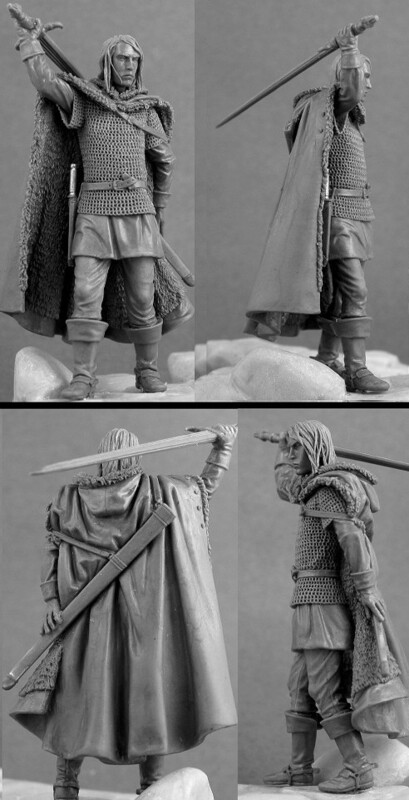 Testor’s is bringing in other world-class sculptors as well… starting with Julie Guthrie and Sandra Garrity, two more titans in the world of miniatures. We are all determined that the Ice and Fire figures will be second to none. The wargame and accompanying 28mm minis will be last out of the gate, and should debut in the summer of 2006, allowing plenty of time for design, development, and playtesting. Tom Meier will also be sculpting many of the minis for this range. The game will be designed by renowned developer Andy Chambers of Red Star, Gearwerks Games, and Games Workshop, designer of the eagerly anticipated Starship Troopers game from Mongoose. Testor Corporation spokesman David L. Veres said, “Fans of the popular series have been clamoring for quality products based on the series and we’re proud to team with Mr. Martin on this exciting, eagerly anticipated venture.” Although plans are in the discussion stages as yet, Testor’s is considering some exciting possibilities for their Ice and Fire line, including a dedicated webpage, painting contests, a “figure of the month” mailorder service, and reader polls to allow the fans to help pick the subjects of future miniatures and kits. I will be posting more updates here as plans develop, and from time to time may even show you a glimpse of some of the miniatures in progress. You will also want to keep an eye on Testor’s website (http://www.testors.com ) and Tom Meier’s Thunderbolt Mountain (http://www.thunderboltmountain.com ). Until Testor’s has their dedicated webpage up amd running, fans who would like more information about the wargame and range of miniatures can inquire about the products by e-mailing testors@testors.com. Be sure to include either “GRRM” or “Song of Ice and Fire” in the subject heading.